Fresh produce, live plants, baked goods, fine art and antiques are just a few of the items offered by vendors at Palafox Market in Downtown Pensacola. 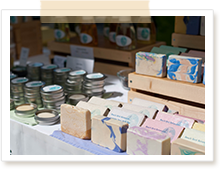 Items originate directly from onsite vendors who grow, make, or create the fruits, vegetables, herbs and art for sale. Introduce your product and discover a new base of fans that averages 1,500 to 4,500 customers on any given Saturday of the year. Vendors and goods sold at Palafox Market change weekly to accommodate a range of local talents and community interests. The market is open every Saturday 9am-2pm, rain or shine. So come on by and see what the market has to offer! Located on N. Palafox St., in Martin Luther King Jr. Plaza, between Wright St. and Chase St., Palafox Market is centrally located to many shopping and dining establishments in Downtown Pensacola. 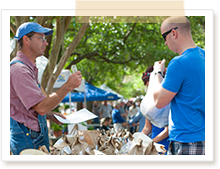 Thank you for voting us "Best Farmer's Market," "Best Free Thing to Do," and "Best Place to Buy Local Produce"
If you love Palafox Market, please add your review to Google, TripAdvisor and Facebook!